Nicolas Kyvernitis Electronics Enterprises (NMK), a sole distributor of Neutrik in the Middle East region, recently hosted its second NeutrikOpticalCon Certified Seminar held from 20th to 21st January 2014 in its Deira Office in Dubai with a selected list of eight attendees from the region.The objective of the seminar was to provide the invited attendees the opportunity to learn about fundamentals and new trends in fiber connection technology. The first day of the seminar, conducted by Neutrik product application engineer Frank Studer, focused on fibre optics theory, including applications for transmitting and receiving audio, video and communications. 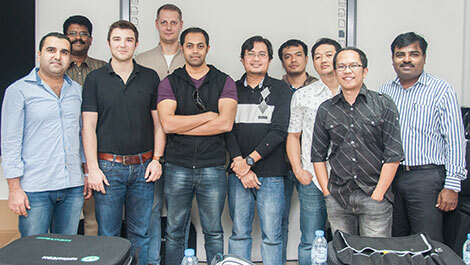 The second day was dedicated to hands-on workshop that highlighted the NeutrikOpticalCon field assembly kit. Attendees were given the opportunity to improve their skills on terminating LC connectors, applying the rugged NeutrikOpticalCon connectors and testing the terminations. “NMK is proud to conduct such an international certified seminar to refresh and introduce standards to the market.” commented Pavel Aheuin, Product Manager for Neutrik at NMK. He added, “Fiber has already begun being the most standard transport system in the AV market." NMK’s mission is to continue educating their partners and clients in the innovative designs, features and benefits of the successful and strong brands in the professional audio market. Consequently there will be another series of certified courses under the title Academy 3.0 held during the month of May and June this year in Dubai. Those interested can email education@nmkelectronics.com to subscribe on education alerts.